Last summer, I took a 4 day trip to Thailand. While there, I ate every single bit of Thai food I could. It was all delicious, of course. Thai food is awesome! One of my favorite dishes was the coconut sticky rice. It’s such a simple & delicious dessert. I was actually intimidated about recreating it at first. I imagined it would be difficult & time consuming but in actuality it was extremely simple to make. 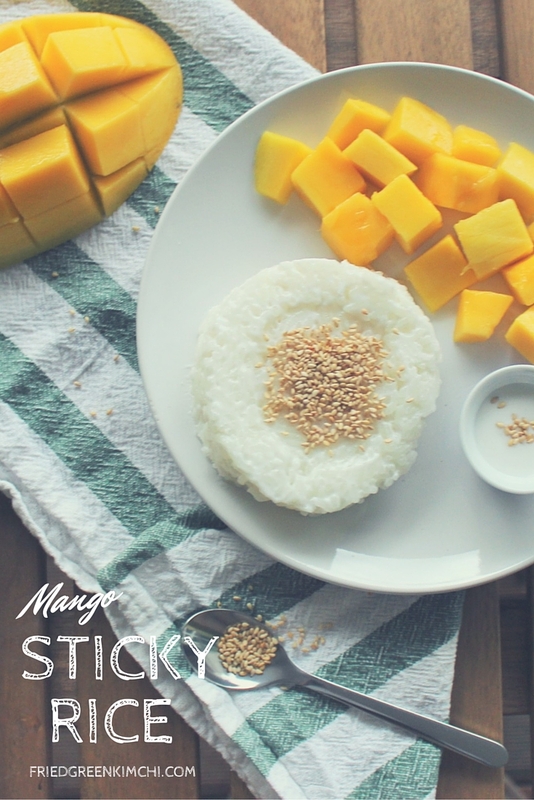 Check out my step by step instructions & recipe for Mango Sticky Rice. Step 1: Get yourself some Thai Glutinous Rice & Coconut Cream. Step 2: Rinse 1 cup of rice 3-4 times in a sieve then soak in water for 2-3 hours. Once the rice has soaked, rinse it again then simmer it with 1 1/2 cups of water for around 15 minutes or until the rice has absorbed the water. The rice will begin to look very creamy while cooking. Just let it keep going until the water is absorbed. Step 3: Cook down coconut cream & sugar to make a sweet sauce for the rice. 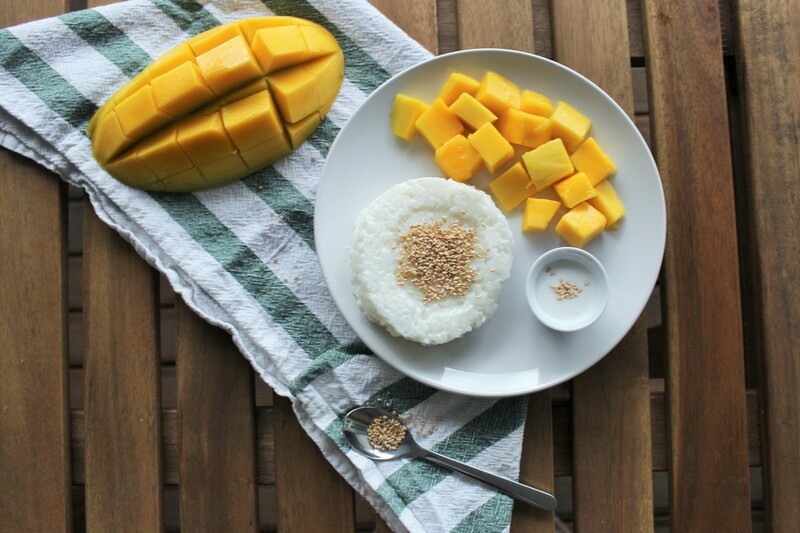 Slice up a mango & shape the rice. The rice will easily shape from whatever dish you press it into. For mine, I didn’t have any small shallow bowls available so I pressed it into a plastic bowl I usually use for leftovers, hence the funny dent on top. It worked fine. The rice should slide right out onto a plate for serving. Top with sesame seeds & the coconut cream. This is good eaten warm or cold. Enjoy! Using a fine mesh sieve, rinse the rice 4-5 times then soak in clean water for 2-3 hours. Once the rice has soaked, rinse it one more time. Place the rice in a pot with 1 1/2 cups water. Simmer on low until the rice has absorbed the water, about 15-20 minutes. Add the coconut cream, salt & sugar to the rice. Cook on low for 5-10 minutes longer. Leave covered for 10 minutes then remove from heat. Warm 1/4 Cup of the Coconut Cream over low heat. Add 1 tsp sugar & stir over heat until the sugar has dissolved in the cream. Shape the rice by pressing in a shallow bowl or cup with the desired shape. Turn the bowl/cup upside down & let the rice slide out. 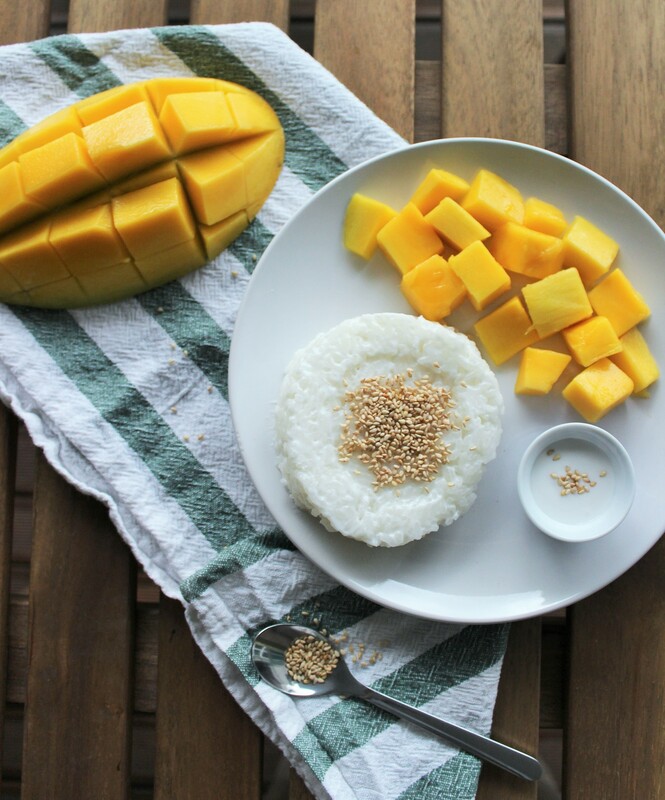 Top with sesame seeds & serve with coconut cream & mango on side. This is so amazing! You know, I had never hear of glutinous rice before. I wonder if I can get it in my area. This recipe looks delish! Great recipe. Looks super tasty! Give it a try! Just make sure you use that type of sticky rice for it. How delicious is this?! Saving this recipe to make soon. Thanks Nicole! Let me know what you think when you make it!